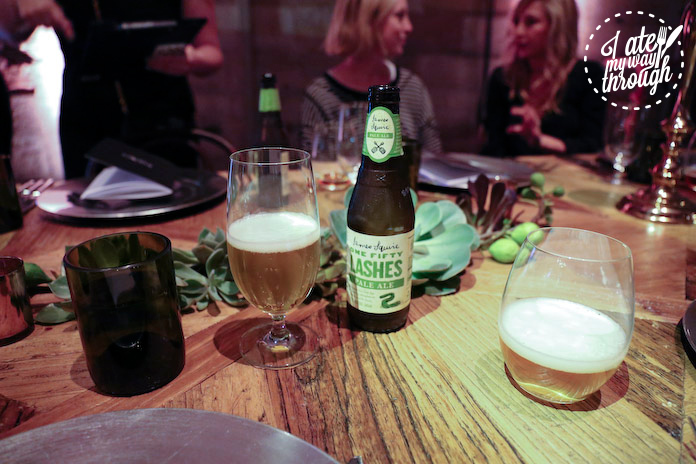 Have you ever wondered what the history of beer is in Australia? How did we get to where we are today with such a rich culture of beer drinking? 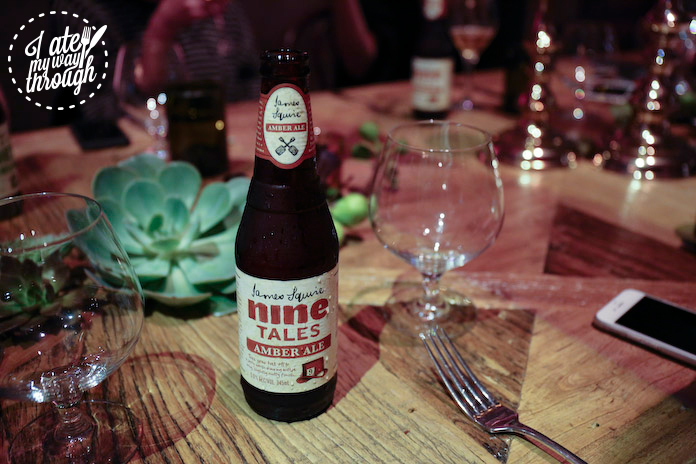 As a beer lover, I sure have and I was very excited to receive an invitation to experience the world’s first edible biography of James Squire — Australia’s first beer brewer! 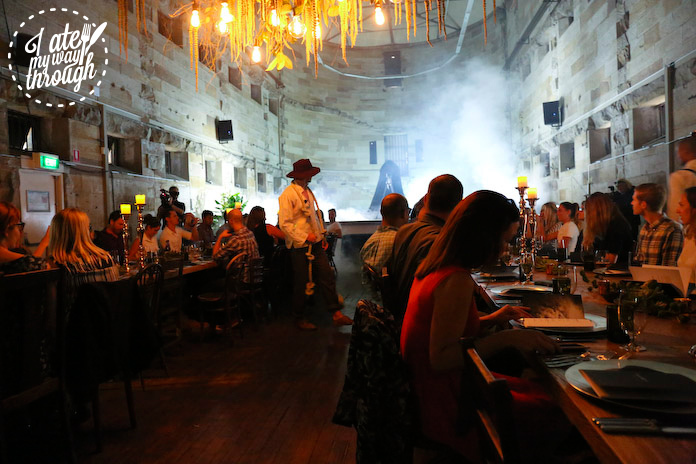 Held at the Cell Block Theatre of Darlinghurst Gaol, it was the perfect setting for a night of theatre and food! 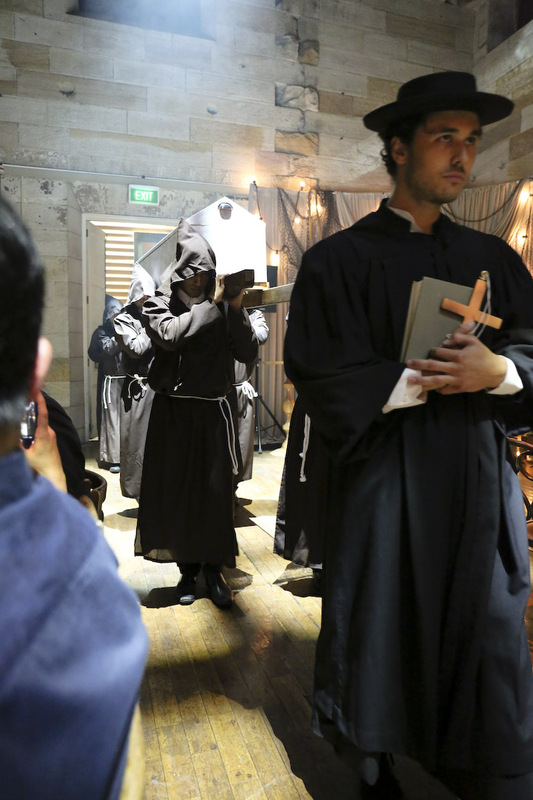 With dark ambiance and rustic decor, we were taken back to the landscape of early British colonisation in Australia. The decor was dramatic and really captured the theme of the night — the biography of James Squire. It was curated by Bompas & Parr who did a fantastic job in portraying the times and bringing the play into life as we discovered the story of James Squire both visually and through our palates. Aria Catering provided the catering so we knew we were in for a treat! As the story goes, James Squire born in 1754 in Kingston, England was a risk taker at heart. At age 20, he was arrested for highway robbery and by 30 he was signed up to the transport convict program for stealing again and soon joined the First Fleet to New South Wales. Almost immediately upon arrival to Sydney in 1787 he was charged with stealing ‘medicines’ — a pound of pepper and horehound, which is a herb that imitates the tangy flavour of hops. James was fined five pounds and sentenced to receive 300 lashes: “One hundred and fifty now, and the remainder when able to bear”. This is where the name of the One Fifty Lashes Pale Ale came from. 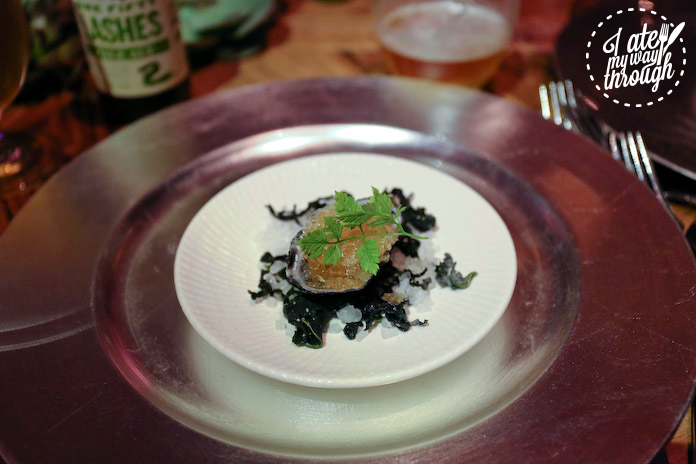 To kick off, we had the pairing of One Fifty Lashes Pale Ale with fresh oysters dressed with finger lime caviar and Hop Thief 7 American Pale Ale granita and chilli caramel glazed pork belly cubes. The oyster was divine, with a hint of sweet, sour and freshness from the lime caviar. 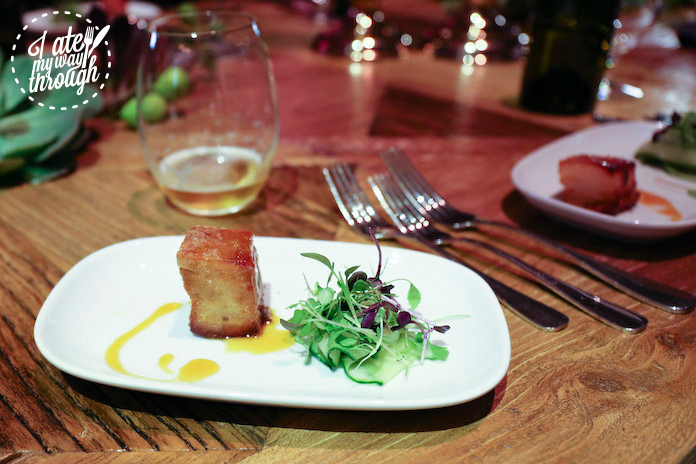 The pork belly was crisp and cooked to perfection. These starters whet our appetites ready the next chapter of the edible biography. 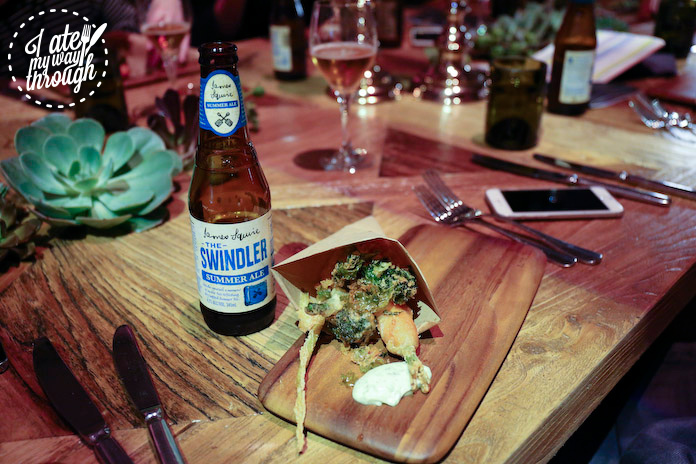 Before we head to mains, we had a mid-course vegetable reviver, this was paired with The Swindler Summer Ale together with Hop Thief 7 American Pale Ale beer battered crispy farm-grown veggies of carrot, kale, broccoli and asparagus. By this stage of the biography, the year was 1795 and James upon emancipation was granted a 30-acre plot for just one shilling apiece, building up an estate along the Parramatta River of 1000 acres by 1806. This provided the land he needed to grow Australia’s first hops and brew his delicious and crisp beers. 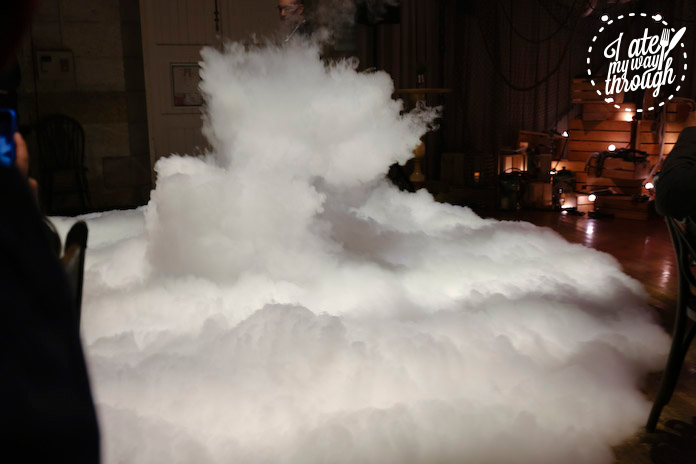 We were introduced to our main course amid a sultry fog with the use of liquid nitrogen. It was revealed that in 1805, James presented the Governor with two vines of hops — Australia’s first ‘homegrown’. So impressed with flavour and quality, the Governor ordered a cow be given to James! With the new found enthusiasm, James Squire built his Malting Shovel Tavern at Kissing Point. We were served the deconstructed ‘beer’ wellington, which was served with parsnip cream, wilted sauteed spinach and glazed baby carrots. This was paired with Nine Tales Amber Ale. 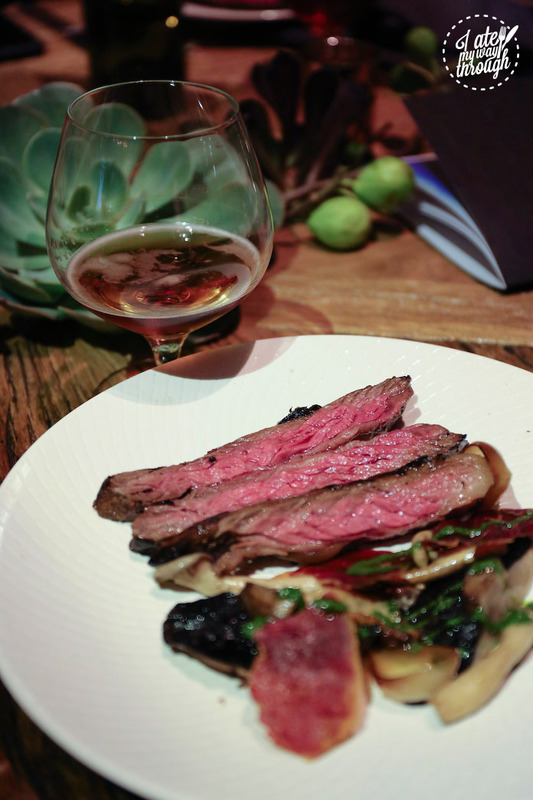 The Beef was perfectly cooked and to my liking, medium-rare, it was tender and brilliantly matched with the amber ale with added a nice nutty finish to the palate. James Squire became a district constable, which were special constables in the 1800s sworn in to maintain the law and protect life and property in rural districts when there were insufficient officers of the Police Force. This was an ironic contract to James’ past as a convict and as a robber. In the late stages of his life, he acted as a banker to his poorer acquaintances and was generous with his money. For dessert we had the beer gelato of yeast and honey, which was served alongside the Constable Cooper Ale and brown bread panna cotta, with malt and pollen crumb. It was also paired with the Constable Cooper Ale. This was a really interesting take. 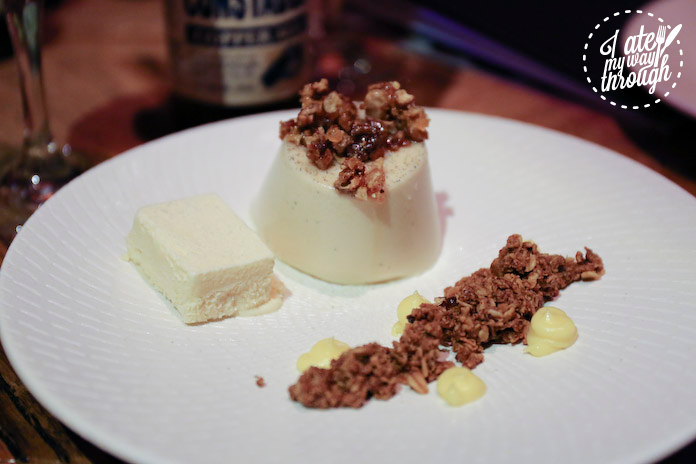 Having never had a panna cotta with beer before, the initial reaction was a weird sensation to the tongue as one did not expected the bitterness in a sweet dessert! However, given a few more bites and there was greater appreciation of flavours and balance between sweetness of the pana cotta with the bitterness from the cooper ale. It brought back memories of my younger years when I started drinking beer, sometimes things don’t taste as they appear! The malt flavour really shone through and we learned the importance of malt in beer. It’s one of the core ingredients of beer making and the type of malt used can affect the beer’s appearance and flavour. 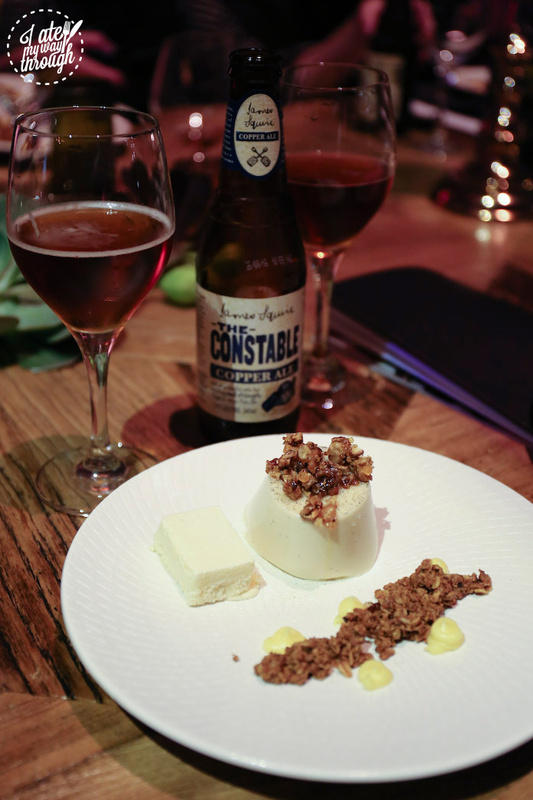 The Constable Cooper Ale and brown bread panna cotta, with malt and pollen crumb. Beer gelato of yeast with Honey. As with any good story, there is always an ending. On 16 May 1822, aged 67, James died and his passing was marked with the biggest funeral ever held in the colony at the time. This reflected both his popularity and transition from rogue to a reputable philanthropist. He died as one of the richest men in Australia. He was buried at Sydney’s Devonshire Street Cemetery (now Central Station). For all he had achieved and paved the way for the beer drinking culture that we have today, we salute you Mr James Squire! The scene was quite dramatic with a full sized coffin carried into the theatre and to our surprise later on, the cheese course was also served from the coffin! 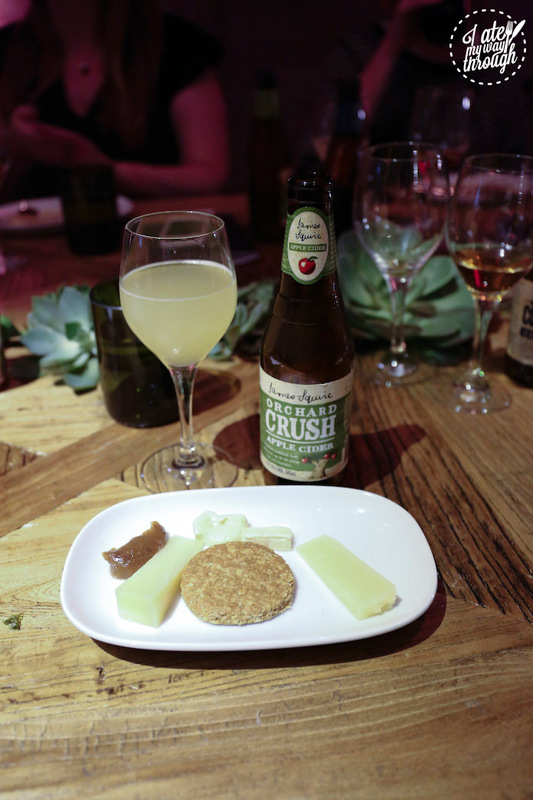 The cheese was served with loquat chutney and oat biscuits and was paired with the Orchard Crush Apple Cider. 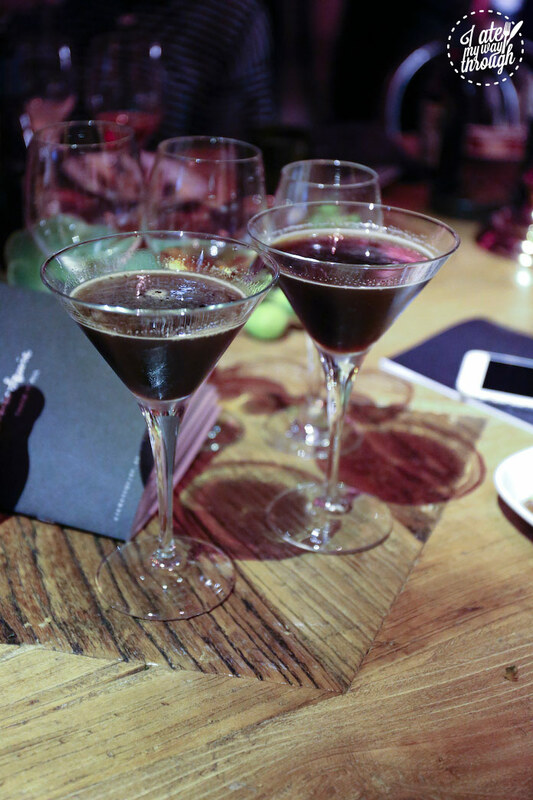 To wash it all down, we concluded the night and to celebrate the great beer pioneer in Australian history with a Jack of Spades Porter Martini with vodka and coffee liquor. Overall it was a fun night — the theatre, the insight into the life of James Squire and the ability to taste the variety of beers on offer side by side (I’ve found a new favourite beer in The Swindler Summer Ale). The creative use of beer in cooking has also opened up my mind on the possibilities the next time I crack open a bottle of beer. Below is the recipe for the deconstructed beer wellington; now you too can create the delicious dish with beer! Marinate the steak in 1½ bottles of Nine Tails Amber Ale along with half the mustard and honey. Cover and leave for 24 hours. Fry the slices of prosciutto until crisp, then bake for 15-20 minutes or until very crisp. Take half of the mushrooms and sauté with garlic, season well and add to a food processor with a few knobs of butter, tarragon, chives and a small bunch of parsley. Blend until a smooth paté consistency, place in a bowl and leave in the fridge until needed. Peel and chop the parsnip into small cubes. Add to a pan with the milk and the remaining clove of garlic, season and simmer until soft. Then in a blender, with a few knobs of butter, blitz until very smooth. Place into a pan, cover and leave in the fridge for later use. With the remaining beer, add to a pan with the remaining honey and reduce. Finish with butter and whisk well. Add the remaining parsley, lemon juice, olive oil and salt to a blender for 5 minutes on high. Pass through a sieve and pour into a bottle. Cut the shallots in half and take out each layer individually – take care not to damage the shallot shells. Roll out the puff pastry as thin as possible, then cut out rounds with a 2cm ring cutter. Dip into beaten egg then place into a hot oven for 15 minutes: They should puff up and resemble mushrooms. Take the steak out of the marinade and allow it to come to room temperature, rub with oil and season generously with salt and pepper. Add to a searing hot pan for 1½ minutes (rare) or 2½ minutes (medium rare) on each side. Take out and rest. In the hot pan, add the shallot shells, cut side down and burn the edges. Leave for 2-3 minutes until just cooked through but holding their shape. In the hot pan add rest of the mushrooms along with butter and season. To assemble, add a spoonful of parsnip purée to the centre of a wooden plate/board, either in a circle or smeared across the plate. Add three small spoonfuls of mushroom paté around the parsnip and assemble the decorative mushrooms on top of the paté long with the pastry mushrooms. Add the shallot shells. Slice the steak and place in the centre, scatter the prosciutto crisps over and finish by adding the parsley oil to the shallot shells. As the name suggests, Zen is calm and relaxed. He has a strong passion and excitement for life and is fascinated by the littlest of things. With a great tongue (to eat), eye (to take photos) and hands (for holding the food lighting), Zen is truly an accomplished individual. He is light-hearted and is never one to take anything too seriously; a lover of beer and a lover of Jen (aka Jenius), his favourite dishes almost always involves scallops. 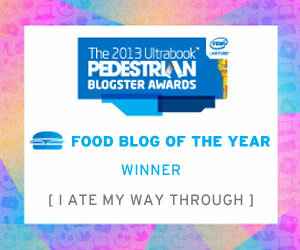 He is best known for using sauce on everything he eats.